We have several of those lizards around our place, the biggest being about 8" or so...wish I knew the correct name for said "beast"
This looks surreal, with the concrete and the green leaf and the lizard. Amazing that you got them all together. gee, the wildlife i would like to get photos of comes out at nite here... and they are very skittish little critters -- geckos. Your little critter is definitely eyeing you to see what you are all about. Now it always feels like a special treat when I open your blog and there's a new post! And they come more often than you indicated they would ;-) which is great too. Hugs to Cary and Bear, my favorite characters among the farm creatures. And do you know that one night I dreamed of Patchy Cat? 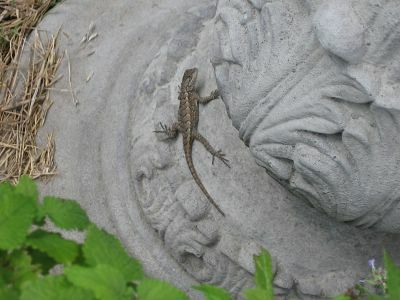 I have a friend that laughed at me about the lizard on my blog....glad I'm not the only one who likes those little guys! My husband took a nice close up of one earlier this month, if you're interested. Happy Tuesday, FG Susan & all my little farm critter friends! He looks a lot like the Western fence lizards I get in my veggie garden out here in Central Calif. - they love to run along the wooden fence rails and do push-ups. We had a lot of little tiny baby lizards this year - must be a good year for the little guys! Did you sculpt that stone? Brilliant photograph, as always. My son has a pet lizard.